Built for professionals, the Rio Pro’s superior card printing quality is enhanced by ICC profiles that seamlessly map colors between software and the printer. The clear 4-line display provides intelligent user information and interaction. 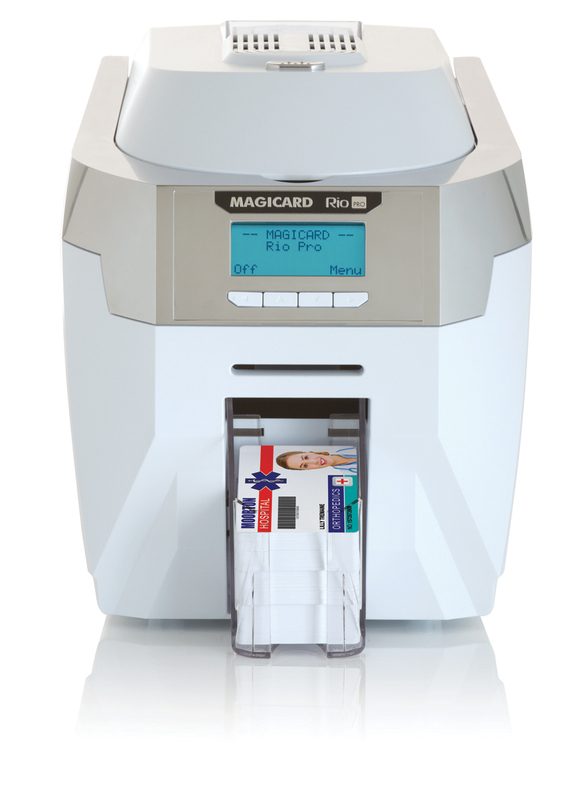 Batch print with the interchangeable 100-card feeder or print one-offs or rewritable cards with the hand-feeder. Built with high performance purpose-built materials and advanced components, the Rio Pro is designed and manufactured at Ultra Electronics’ center of excellence for manufacturing in the UK and is backed with the market-leading UltraCoverPlus warranty. Color dye sublimation, monochrome thermal printing and rewritable technology. A HoloKote security watermark can be printed across the card surface. When used with HoloPatch® cards, one area of the HoloKote watermark is highlighted as a high visibility security seal. A choice of 4 standard HoloKote designs and 1 standard HoloKote Flex design are selectable from the printer driver. For added security, Custom HoloKote enables customization of the watermark to an individual logo or security design. - Available in North America, EU and other selected territories. Elsewhere 12 months limited warranty. Windows 2000 Professional (SP4), XP, Windows Vista and 7 (32/64 bit compatible),Windows Server 2003 R2 SP2, Server 2008 (32/64 bit compatible). 18.5” L x 8.6” W x 9.8” H (470mm L x 220mm W x 250mm H) including feeder and stacker. Sheltered office environment 50°F to 85°F (10°C to 30°C).